It is a stable workout platform for its durable structure and high-speed design. A wide range of resistance options with 25 levels of resistance. 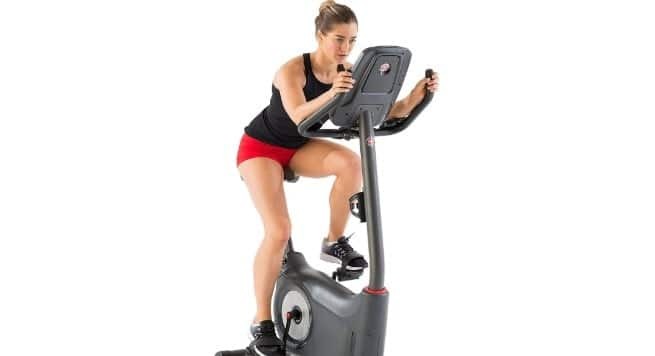 Schwinn 170 upright bike has a large and thick padded set for a comfortable workout. Adjustable handlebars for a comfortable workout position. Heart rate sensors are placed on handlebars ergonomically that can detect your heart rate during exercise. Seat height adjustment for any user’s height. For your workout motivation, a media tray is present to keep your Smartphone or tablet. It has USB charging and In-console speakers with the MP3 input port. It will keep you fresh with three wheels adjusting fan. To keep you hydrated a water bottle holder is present. You can move it from one place to another place quickly because it has a transfer wheel. 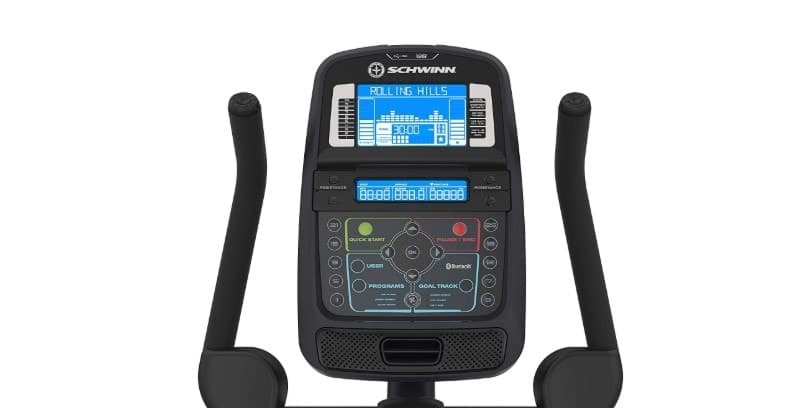 It enables Bluetooth and USB connectivity that connect to Schwinn ConnectTM and MyFitnessPal. You can download your workout data from your MyFitnesspal account. It features 9 heart rate programs. All programs have the custom settings. Most user-friendly and excellent programs: 2 fitness test programs to test your body improvement. You can store your data into your four personal programs. To measure how quickly your heart rate recovers one recovery test program exists. It has the quick start program. Workout data includes Cycling Speed, workout Time, and Distance covered, Level of resistance, Revolutions Per Minute, Heart Rate, Calories lose, Workout Intensity, Heart Rate Zone, Users Goal, and User Achievement. The price is lower than the other competitors. The bike has the same features that all other cycling bike has. But the cost is about $100 less than other competitor’s indoor cycling bike. You can read our full spin bike reviews to compare the price and quality of different bikes. It has excellent features of display and lots of useful programs that make it a great indoor bike. It generates smooth and quality resistance. Easy data tracking and monitoring system. Quiet and easy to operate. Though it has mostly positive reviews of consumers, some negative are also found. Some users report that its screws become easily. One consumer reports that some parts are missing. Some consumers say that suppliers are providing them the defective item. So, it is my advice to purchase from a reliable source those has excellent warranty coverage that you can replace it easily after any problem. Schwinn provides a great deal for the user with excellent product warranty. Keep in mind that Schwinn is a famous innovator of a cycle manufacturing company for a hundred years. So, you should not have any doubt about the quality of this bike. It is straightforward for the Schwinn 170 upright bike to assemble. It will take maximum of two hours for a single person. If you have one helper, you can join it within one hour. You will feel complicated with the parts when it will be shipped to you. But the manufacturer will provide a details guide to you to make it assembled and workable. Read the manual carefully and check the parts. Buy from the reputed supplier because some bad supplier can supply the broken components. So check it very carefully. 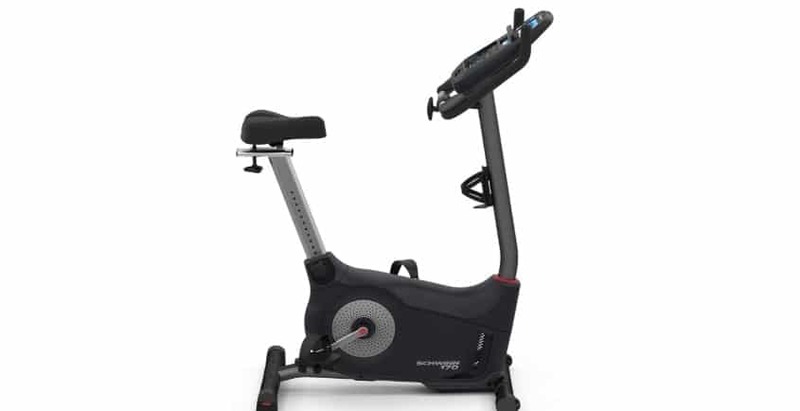 The manufacturer will provide Schwinn 170 upright bike manual with this bike during shipping. This manual has the full description of the assembly and user guide to use. You should not need any trainer when you follow this manual properly. You will be able to use it efficiently using this manual. It offers excellent warranty policy for users. If you buy it from any superstore or and sports outlets, then the shipping cost will vary to a different market. It will be shipped to your home with a weight of about 72IBS. Usually, the exercise bikes are a busy item in the fitness club and GYM. Because all users love it very much and it is a recommended item by a fitness trainer. When this upright bike is in your home, it will be a busy item. Everyone will use it for fitness. It allows the maximum user’s body weight up to 300IBS. From a young man to the older person and very overweight member of your family can use it. It is excellent equipment for you to tone up the lower part of the body. The price of the Schwinn 270 upright exercise bike is lower than other bikes according to the quality. You can buy it spending just under $500. When you spend more than $1000 definitely, you can get a user-friendly exercise bike with great features. But you can buy this bike within affordable budget under $500. I can ensure you that you will be happy after using this exercise bike. It has excellent warranty policy and many workout programs at a lower price. Highly recommended.